Students from the Fashion Design Academy at Lantana�s Santaluces High School were enlisted to design attire representing a number of historical periods or inspired by Broadway musicals for 14 Barbie dolls. The project involved 27 students, all of whom were enrolled in a class taught by Michelle Matella. The dolls are currently on display at the Museum of Lifestyle & Fashion History in Boynton Beach as part of its ongoing Barbie: History, Fashions & More exhibit. The Barbies shown here include: at top, �Cleopatra� by Carline Camille and Alesha Veres; above, �Roaring 20s� by Angelica Mendez and Tyesha Iverson; and, below, �Grease on Broadway� by Sashie Dixon and Lorelei Lopez. By the way, Santaluces� Fashion Design Academy is the only fashion-design program in Palm Beach County. Students who complete the four-year program receive a vocational certificate in fashion design from the State of Florida. The Museum of Lifestyle & Fashion History is located in the Boynton Beach Mall, 801 N. Congress Ave., Boynton Beach. 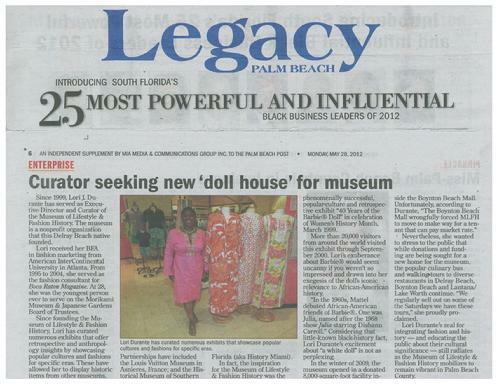 For information about the exhibit and the museum, call (561) 243-2662 or send an e-mail to: BarbieExhibit@MLFHMuseum.org. This just in: Ken, or Barbie's main squeeze, is turning 50. Ken Carson, as the Mattel manufacturers called him, was born on March 11, 1961. For those who aren't avid Barbie followers, she was born on March 9, 1959, a full two years and two days earlier than Ken. But to celebrate Ken's big milestone, the Museum of Lifestyle and Fashion History in Boynton Beach has added a special display all about the male icon within their ongoing "Barbie: History, Fashions and More" permanent exhibit. The Ken installation debuted last month to commemorate the birthday, featuring more than 35 Ken dolls posing with clothes, friends and family alongside the collection of 100 Barbie dolls. Fun facts posted throughout the exhibit reveal details about the Ken legacy. The original doll, for example, was named after the son of Mattel founders Ruth and Elliot Handler in Willows, Wisconsin. A younger brother, Tommy, was also added to the Ken collection in 1997. True to Pisces form, Tommy is loyal, supportive, and a dreamer. The exhibit begins with the history of Barbie's creator, Ruth Handler. The walls of the exhibit room are painted Barbie's signature color, pink, and the collection takes visitors down memory lane by showing both Barbie and Ken's evolution through the last five decades. When Ken arrived 50 years ago, he was featured with flocked blonde and brunette hair versions and wore red cotton swim trunks, cork sandals and a yellow terry cloth towel. In 1962, Ken's locks turned plastic after Mattel realized his hair wasn't holding up as fleece. Soon after the doll debuted in stores, Barbie and Ken's relationship took to the next level. They were married in 1965 and were introduced by Mattel through a "Wedding Day Party" set that included a tuxedoed Ken doll. Yet despite a life full of fantastic plastic, a wardrobe fit for a king and a beautiful girlfriend, all good things eventually came to an end for Ken. The duo broke up on Valentine's Day in 2004. Boca Raton resident Julie Guzzetta-Hartnett said she donated the original wedding day Ken doll from her childhood to the museum's Barbie collection in 1999. "I remember getting my first dolls from my neighbors. After that, I just played for hours and hours," she said. As Guzzetta-Hartnett walked around the exhibit, her eyes sparkled as she recalled memories of her Barbie-filled childhood. "I just loved her look. It was so original. And, of course, her clothes. And I loved the fact that Barbie represented that women could be anything they wanted," she said. The dolls in the exhibit came from more than 20 collectors throughout South Florida and Canada. One avid collector, Julie Walls-Honeycutt, of Boca Raton, said she had numerous collectible Barbie and Ken dolls in the exhibit. "I just enjoyed setting them up and looking at them. These dolls represent creativity, make-believe, and a part of fantasy that you can escape to," she said. Visitors can take a few minutes and catch the exhibit's companion film, "The Fabulous Vintage Barbie Fashion Show." The video details the fabulous fashions the dolls have sported throughout the years. One of the exhibit's highlights is a stunning display of the Hollywood Legends Barbie Collection. One set, a tribute to "Gone with the Wind," included Barbie wearing a green velvet dress as Scarlett O'Hara while Ken, as Rhett Butler, sports a tuxedo with top hat. The exhibit succeeds at appealing to a broad audience - past and present - since those generations have played with a Barbie and Ken doll at some point. But let's face it: there's no comparison between the swimming trunks and plainclothes of Ken versus the lavishly chic garments of Barbie. She'll always be the star attraction. "Barbie: History, Fashions and More" runs all season at the Museum of Lifestyle and Fashion History, 801 N. Congress Avenue, #483, Boynton Beach. Admission is $5. Call 561-243-2662, or visit http://www.mlfhmuseum.org. Little did Cameron Park resident Kristina Krieger, 40, know that her hobby of making headbands and purses would land her in the Museum of Lifestyle and Fashion History. But that is exactly what happened. I was a mental health case manager and took a leave of absence when I got pregnant. I started making little hair clips out of fabric. I had been using contemporary fabrics and discovered Lilly Pulitzer vintage fabrics. I listed my items and started getting orders,Krieger said. Krieger explained that most of her orders come from sorority girls back East. Lilly Pulitzer fabrics are very popular in the East � particularly in New England and Southern Florida. For those not aware of Lilly Pulitzer fabrics, they are a blast into the past. They have strong bright colors and cheerful patterns. Pulitzer, herself, is a fascinating member of American high society. She was born in New York and her mother, Lillian Bostwick Phipps, was an heir to the Standard Oil fortune. She attended the Chapin School with the famous sisters, Jacqueline and Lee Bouvier and graduated from Miss Porter's School in Farmington, Conn.
She only attended one semester of college, then left to work as a midwife's assistant in West Virginia and volunteered at the Veteran's Hospital in the Bronx, N.Y. In 1950 she eloped with Peter Pulitzer, heir to the publishing empire. Peter and Lilly moved to Florida and raised three children. Peter owned many citrus groves in Florida and Lilly opened a juice stand at one of the groves in Palm Beach. One of the problems was that squeezing the oranges made a mess of Lilly's clothes. She wasn't going to give up her juice stand so she found a way to keep cool and still look stylish at the same time. Lilly had her dressmaker design a sleeveless cotton dress with bright, colorful designs to camouflage the orange stains. The comfortable little dress was called a shift and became a fashion sensation. Eventually Lilly started selling her little dresses at the juice stand. The dress outsold the juice � so she decided to start focusing on designing. Through the 1960s, '70s and early '80s Pulitzer's colorful designs remained popular. She retired in 1984 to spend more time with her grandchildren. In 1993 she allowed her line to be revived and serves as a creative consultant. In this new century the colorful Lilly Pulitzer designs are still popular. Today there are 75 Lilly Pulitzer Signature stores and her line is also sold to major department stores such as Bloomingdales, Nordstrom and Neiman Marcus. Krieger has been making accessories from Lilly Pulitzer fabrics for three years. I started with the contemporary fabric but then I found the vintage. Vintage fabric was made from 1959 to 1984. In 1993 she sold the name and now Sugar Town Inc. owns it. They try to stay true to the original patterns. You can recognize it by the color combinations. There is a big resurgence of popularity going on back East, Krieger said. Krieger also has her own collection of vintage Lilly Pulitzer dresses in her home studio. They are on mannequins and never fail to inspire the modern day designer. I'm just a stay-at-home mom who developed a hobby and I didn't anticipate that I'd make the income that I do now, Krieger said. I started doing it so I could stay at home with the kids so I can't lose sight of that. I work 20 to 30 hours a week � after the kids go to bed. Krieger is married and lives in Cameron Park with her husband Bret, 44, and three daughters � Sadie, 7, and twins Linden and Hollyn, 4. From the first clips and headbands, Krieger has branched out to baby booties, clutch bags and bracelets all in lovely Lilly Pulitzer fabrics. Besides the boutiques back East she sells items through her own Website and offers wholesale pricing. That's also what got the talented stay-at-home mom noticed by the Museum of Lifestyle and Fashion History. The museum is an international showcase located in Florida, that offers educational programs, and history and retrospective anthropology exhibits. The exhibits feature lifestyle, cultures, people, places, fashion trends, clothes, architecture, furnishings, decorative arts, interior design, toys and information about popular uses of artifacts by people of various periods of time. The museum collects and preserves objects and artifacts so that it can provide educational and cultural arts programs for children, families, the greater community and the economically disadvantaged. In addition the museum's goal is to enhance tourist attractions and the economy of its local area. I was flattered that the museum wanted me to contribute to their exhibit, said Krieger. The Lilly Pulitzer fabrics are the focus of the exhibit. It's such a huge honor to have been asked to provide items for such a reputable museum. The Museum of Lifestyle and Fashion History currently has the nation Barbie exhibit. It is also one of the few museums entrusted with items on loan from the Smithsonian, she said. On Monday, I took a drive down to Boynton Beach to visit, for the first time, the Museum of Lifestyle & Fashion History. The museum is located in the Boynton Beach Mall (about 15 miles south of Palm Beach) in an 8,000-square-foot three-gallery space just a few doors down from Sears. Not being a mall regular, I was surprised to see that real mall cops, not just those in the movies, actually do ride Segways as they patrol. The Museum of Lifestyle & Fashion History was established in 1999, originally in Delray Beach, but relocated to the mall space last winter. The current exhibits include a Barbie retrospective in two galleries and a show of fashion treasures from the museum�s collections. Lori J. Durante, the museum's founder and its executive director and chief curator, outlined plans for two upcoming exhibitions, both of which have strong Palm Beach connections. Lilly: For the Love of Lilly, an exhibit devoted to Palm Beach's own fashion icon Lilly Pulitzer, featuring more than 100 pieces of vintage Pulitzer-designed clothing and accessories opens August 3 and will be on view through May 31, 2011. Scaasi: An Iconic American Fashion Designer, featuring couture designs by longtime winter resident Arnold Scaasi that are part of the museum�s permanent collection, opens September 25 and runs through June 19, 2011. Just so you know, the Museum of Lifestyle & Fashion History is open Tuesday to Saturday, 10:30 a.m. to 5 p.m., 1 to 5 p.m. on Sundays. Adult admission is $5. For information, call (561) 243-2662 or go to www.mlfhmuseum.org. I was totally one of those girls growing up who hated Barbie dolls. I never really understood the appeal of them, never appreciated their really cute outfits (I was only excited to mismatch them), never liked their weird, rubbery, superhuman shape. Now in my early 20s, I forgive Barbie for being rubbery. I don'' know how I ever overlooked that Barbie is, like, the richest girl in the world, with a whole fleet of cars, dream houses all over the world, elegant ball gowns and couture outfits, and every cool job you can imagine (although one of her most recent jobs was fashion magazine intern, so I guess I kind of got her on that one). Perhaps the best way to appreciate Barbie in all of her glory is by heading to the Museum of Lifestyle and Fashion History for the "Barbie: History, Fashions and More" exhibition. I checked out the exhibition yesterday and got a tour from Lori Durante, the fabulous executive director of the museum, and officially came to the realization that in my next life, I am so coming back as Barbie. The exhibition has 50 years' worth of Barbie dolls�from the original German "Lilli" that inspired America's most iconic doll, to the very first striped-bathing-suit Barbie, to Barbies in ballgowns and Barbies running for president and Barbies landing on the moon and Barbies wearing couture. It is clear from this exhibition how Barbie's outfits, styles and looks from throughout the years follow events in American history and fashion throughout the decades. From Barbie's 1960s circle skirts to the DVF wrap dress, Barbie has worn it all�and she's been everything from a doctor to a rapper. And to think, after 50 years, she is still blonde and beautiful and skinny. I totally hate her. The exhibition also features a series of Barbie illustrations by students at Miami International University of Art & Design, a real-sized DVF wrap dress that was designed for Mercedes-Benz Fashion Week based on a Barbie design, and lots of fun facts about the history of Barbie and the controversies she sparked during the past 50 years. Don't miss this one at the Museum of Lifestyle and Fashion History�make sure to head over before the end of July, when they'll be making room for their upcoming Lilly Pulitzer exhibition. Biloxi native designs shoes for � Barbie? BILOXI - At 21 years old, Biloxi native Rebecca Washum has achieved a feat most aspiring fashion designers can only hope to accomplish during their tenure in the competitive industry � designing one-of-a-kind shoes exclusively for that legendary American icon, the Barbie doll. As a third-year accessory design major at Miami International University of Art and Design, Washum's signature Malibu Barbie peep-toe wedgie was one of 16 footwear designs selected to be showcased at "Barbie: The Golden Anniversary," a history and anthropological exhibit at the Museum of Lifestyle and Fashion History in Boynton Beach, Fla. Through a curriculum-infusion project developed by the museum, design students created footwear designs and clothing sketches for futuristic Barbie under the guidance of MIU professors Amy Berkowitz and Lynda Devita. "(Washum) is extremely talented, creative, thinks outside the box and isn't afraid to take risks," Berkowitz, a MIU shoe design and product development professor, said. "Rebecca has done some unbelievable shoe designs and there are some original designs that have already been made in Colombia." Inspired by the tone and vivacity of 1970s Malibu, Washum's design uses a bright-pink, yellow and teal color scheme and is embellished with a fuzzy fleece material. But the most exquisite feature of the heels are the mini-oasis scenes, reminiscent of sunny California, built in the hollow wedge of each shoe. "I wanted to convey the spirit of what Barbie is all about and the colors of Malibu during that time frame in Barbie's extensive, fun and poppy history," said Washum, a 2007 graduate of St. Martin High School. "Deep turquoise, hot 'poppy' pinks, sunny yellows and lush greens are very indicative of the fun, carefree feeling during that period." The exhibition developed by the museum covers 50 years of Barbie's cultural influence and includes vintage Barbie dolls, such as the original 1959 Barbie, 1960 Busy Gal Barbie, 1970s Malibu Barbie and accessories, 1963 Midge doll, 1961 Ken dolls, and 1970s Skipper doll. Also on display is the Diane Von Furstenberg original jersey wrap dress designed for the first-ever 50th Anniversary Barbie Runway Show in 2009 during Mercedes-Benz Fashion Week. The exhibition will end April 1. "I am excited about getting my work out there for the world to see because the more eyes that witness something, the more real that thing becomes," said Washum, who also designs clothes, hats, handbags and jewelry. "I was superfluously overjoyed that my work would no longer be just the fodder of my own personal enjoyment and the enjoyment of a few close friends and relatives. It makes creating it, the process, the outcome and everything so much more fulfilling." Durante 50 a�os la mu�eca Barbie ha gozado de un �xito incomparable y contin�a siendo una pieza de colecci�n favorita entre la variedad de juguetes en el mercado. A pesar de su �xito, tambi�n hay quienes la critican por su belleza y figura inalcanzables para una persona real. Pero, de lo que no cabe duda es de su importante lugar en la historia. Alrededor de esa influencia se desarroll� la exhibici�n Barbie: The Golden Anniversary, un proyecto conjunto entre la Miami International University of Art & Design y el Museum of Lifestyle & Fashion History, en el que adem�s colaboraron un grupo de estudiantes de dise�o de moda de la universidad. Barbie: The Golden Anniversary, que se inaugur� recientemente en el Museum of Lifestyle & Fashion History, en Boynton Beach, es una exhibici�n llena de detalles hist�ricos y antropol�gicos que muestran c�mo las diferentes ediciones Barbie, los miembros de su familia, amigos y novios se han interrelacionado con la historia, la gente, la moda y los estilos de vida del mundo real. M�s de 17 coleccionistas privados y organizaciones del sur de la Florida, de ciudades como Delray Beach, Boynton Beach, Boca Raton, Jupiter, Greenacres y Miami, han proporcionado a la muestra cientos de mu�ecas y accesorios vintage. Otras piezas pertenecen a la colecci�n permanente del museo. Por otra parte, bajo la direcci�n de los profesores de Miami International University of Art & Design, Amy Berkowitz y Lynda Devita, los estudiantes de dise�o crearon 16 pares de zapatos junto con una serie completa de bocetos de ropa para una mu�eca Barbie futurista. La serie fue a�adida a la exhibici�n. M�s recientemente, se prest� a la muestra un vestido en talla de adulto que cre� el a�o pasado la dise�adora Diane Von Furstenberg inspirada en Barbie y con motivo de celebraci�n de los 50 a�os de la mu�eca. El vestido wrap --que se envuelve en el cuerpo y se anuda a la cintura--, sello de la dise�adora, fue confeccionado en un jersey estampado en tonos rosa, tela exclusiva de Barbie, el cual se present� en febrero del 2009 en la pasarela de la Mercedes-Benz Fashion Week, en Nueva York. La mu�eca Barbie fue inventada en 1959 por Ruth Handler (co fundadora de Mattel), cuya hija se llamaba Barbara. La presentaron al mundo en la American Toy Fair, en Nueva York. El nombre del mu�eco Ken tambi�n fue inspirado en el hijo de Handler. La exhibici�n actual es una continuaci�n de la muestra hist�rica y antropol�gica que concibi�, desarroll� y cur� en 1999 Lori J. Durante, directora ejecutiva del Museum of Lifestyle & Fashion History, cuando se celebraron los 40 a�os de Barbie. Entonces, la exhibici�n fue presentada en Delray Beach, Florida, bajo el t�tulo 40 years of the Barbie Doll: In celebration of Women's History Month y tuvo cerca de 20,000 visitantes de diferentes lugares del mundo. Barbie Millicent Roberts, known simply as Barbie to millions, was once a presidential candidate. But everyone knows she�s the champion of reinventing herself, so it didn�t last long. She established more than 100 careers, including stewardess, NASCAR driver, astronaut, and serving in the Navy and the Army both. She marked her 50th birthday in March, and the Museum of Lifestyle & Fashion History in Delray Beach, Fla., is hosting an extended, major celebration with �Barbie: The Golden Anniversary,� on display through April 1 at the Boynton Beach Mall. More than 500 vintage Barbies (including a pony-tailed, black-and-white-striped bathing suit-clad 1959 original), her friends and family members, and accessories are featured. Get acquainted with the Audrey Hepburn Barbie; the I Love Lucy Barbie; and the Peruvian, Austral­ian, Moroccan, Swiss and American Indian Barbies. And bone up on your trivia: Barbie is from Willows, Wis.; she has four sisters (Skipper, Stacie, Kelly and Krissy); she first sold for $3; and she and Ken broke up (sob!) on Valentine�s Day 2004, after 43 years together. Get the details by calling (561) 243-2662 or visiting http://www.mlfhmuseum.org/. Shiny Sheet/Palm Beach Daily News story regarding the Museum of Lifestyle & Fashion History at the Boynton Beach Mall in Boynton Beach, FL. The Museum of Lifestyle & Fashion History in Boynton Beach is organizing an exhibition focused on Palm Beach�s home-grown fashion brand, Lilly Pulitzer. The museum is seeking loans of vintage Lilly clothing, accessories, home furnishings and photographs for use in the show, slated to run August 3, 2010 to May 31, 2011. The deadline to respond is April 30, 2010, so you have a little time to go through your closets in search of those vintage 60s, 70s and 80s Lilly pieces. For further info, you can also call (561) 243-2662. The Lilly Pulitzer exhibit at the Museum of Lifestyle & Fashion History is not affiliated with the Lilly Pulitzer Company/Sugartown Worldwide. No designer personifies Palm Beach like Lilly Pulitzer, and no exhibit showcases Pulitzer�s life and style like the LILLY exhibit at the Museum of Lifestyle & Fashion History in Boynton Beach. In the 1950s, a young New York socialite opened a juice stand in Palm Beach. Upset by the citrus stains that spotted her clothing, she created dresses and outfits in brightly colored designs to camouflage the stains. More than fifty years later, Lilly Pulitzer is still a Palm Beach staple, though known more for her clothing than juice these days. With fabric blooming in bright, bold, and unique prints, Lilly�s designs ultimately became the unofficial uniform for the affluent, and Lilly�s signature pink and green colors emerged as the banner of the authentic Palm Beach lifestyle. In 1959, Lilly became president of her own fashion company, Lilly Pulitzer, Inc. The initial style of the Lilly clothing designs were simple shift dresses that appealed to a wealthy client base that included Lilly�s boarding school friend, Jacqueline Bouvier Kennedy. Others who wore the Lilly designs were various descendants of renowned families including the Rockefellers, Vanderbilts, and Whitneys. Soon, Lilly became known as the �Queen of Prep,� and the company thrived with more than 30 stores across the United States. The company closed in 1984, but was revived in 1992. The LILLY exhibit is scheduled to be on display August 3, 2010�May 31, 2011 at the Museum of Lifestyle & Fashion History. The exhibit will include vintage Lilly Pulitzer pieces such as clothing, home d�cor, accessories, and more, plus various educational programs about design. Owners of vintage Lilly items are invited to loan them along with photos for display in the exhibition. To donate items or for more information, call (561) 243-2662.
the Lilly Pulitzer Company/Sugatown Worldwide. A rendering shows the design plans for the Museum of Lifestyle & Fashion History. Lori j. Durante founded the Museum of Lifestyle & Fashion History, which operated out of a rented space in Delray Beach until 2005. Since then, she has set up exhibitions in temporary locations, but is working to build a permanent spot on 1.4 acres in Boynton Beach. Where: The Colony, 155 Hammon Ave.
An encounter with Barbie prompted an almost 10-year quest to establish a Palm Beach County museum devoted to fashion and lifestyle history. Lori J. Durante, 37, curated her first exhibition, a 40th anniversary retrospective of the popular doll in 1999, at Old School Square in her hometown of Delray Beach. "I thought maybe 200 people would come," said Durante. "It was more like 20,000 people who came from all over the country to see the show." That success sparked Durante to found an institution, the Museum of Lifestyle & Fashion History, which initially was headquartered in Delray Beach. Durante, who worked as an editor and stylist for a Boca Raton magazine publishing firm before the museum bug bit her, made an arrangement with the owners of a downtown Delray Beach shopping plaza for a rent-free space. The museum operated from 2003 to 2005 at this location, until forced to move because of a sale of the plaza. In the meantime, the nonprofit institution appointed a board of trustees; garnered support for exhibitions from government sources, individuals and the business community; and continued operations despite the setback of having no permanent place to call home. Durante also instituted an active acquisition program that now boasts over 300 items, everything from a cache of Arnold Scaasi gowns to vintage toys and a 1939 Maytag stove, all of which are in storage. Over the past two years, Durante has been able to find temporary spaces for exhibitions and events and continues to operate monthly narrated bus tours of historic Delray Beach. Her sights, however, are set on taking the museum to the next level with a building of its own. "The concept of a smaller organization growing to a mid-sized level is very exciting," said Rena Blades, president and CEO of the Palm Beach Cultural Council, which has bestowed grants on the museum in the past. "We are very supportive of any increase of cultural programs in the county." A 1.4-acre site was found in Boynton Beach, which was purchased by the museum, with Durante enlisting Singer Architects of Fort Lauderdale, responsible for the design of the Boca Raton Museum of Art, to draw up a master plan for a Museum of Lifestyle & Fashion History building. "Boynton Beach is a good, central Palm Beach County location," said Durante. "And it's not oversaturated with art and culture institutions." The museum is hosting a fundraising luncheon Thursday at The Colony. "The point of the luncheon is to not only raise money for the permanent facility in Boynton Beach, but to raise awareness about the museum and get people involved with us," said Durante. "We're holding it in Palm Beach because it's one of the important and high-profile communities where we have some supporters and would like to get more on board." To build the first phase of the museum, Durante has a goal of raising $5 million. "That's ambitious, I know, especially with the current state of the economy, but one thing I've learned is that you have to be patient," she said. "We are not rushing here." Durante sees the fund-raising effort as spanning another three to five years before breaking ground, though she will continue to mount exhibitions at locations throughout the county, including a show next year devoted to the subject that started the whole ball rolling: the Barbie doll, who will be celebrating her 50th birthday.